If you’re in the dental industry, you know there’s a standing joke about holding two of the largest meetings of the year in two of the coldest months and places in the country; Boston in January and Chicago in February. We also know that dental peeps are a very tough group, so we’re not going to let a little Polar Vortex stop us! 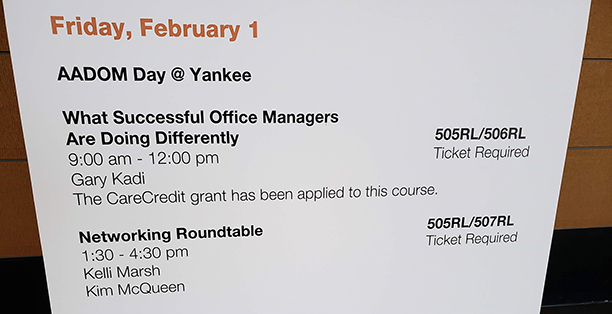 We’ve been fortunate to work with the Yankee Dental Meeting hosting AADOM Day @ Yankee for the past four years. 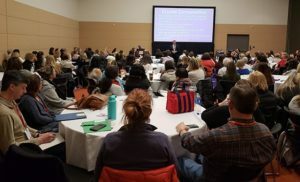 This event is one of my personal favorites, I love coming to Boston and reconnecting with talented dental professionals, and especially the AADOM Tribe! In true fashion YDC19 did not disappoint. Regardless of the below freezing temps, our morning session on Friday was literally standing room only! Huge thanks to Gary Kadi for an awesome session! I couldn’t help but smile when we took a break that morning and heard so many attendees calling their doctors to say, “This course is exactly what I needed today!”. 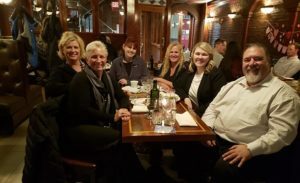 The afternoon session, our Office Manager Roundtable, continued the tradition of bringing dental management professionals together to share ideas, solve challenges and provide support to each other. Another smile when a doctor came to see us later to admit he thought the session was going to be boring, “Man was I wrong. I can’t believe how much I learned during your session!”. Nothing can top spending time with our AADOM Tribe. Special thanks to Jennifer Steadman a nd members of the Boston Chapter for your support! Thanks to all the AADOM members who stopped by to say hi, to encourage others and to just share a smile. I love what I do and who I’m fortunate to serve. The AADOM Tribe is like no other. As we continue to grow, I am in awe of the support given to everyone, by everyone. This kind of warmth will squash any polar vortex! See you next January Beantown!